The Galaxy S series and the iPhone: this begs for an inevitable comparison between the best of two worlds. The Galaxy S8 is a device with enough attributes to pique anyone's interest. So here is our preliminary assessment of it with the phone that will be its arch rival: the iPhone 7 (or at least, will be its biggest rival until the 8th generation of the iPhone arrives in September). For this technical comparison, we’ve relied on our first impressions of the S8 but once we have our full review of the new Samsung flagship, we'll update this article. The Galaxy S8 reaffirms the trend that LG started with its G6: the 2:1 ratio (18:9 in the G6 and the 18.5:9 in the S8). Both the S8 and the G6 are more elongated than what's currently on the market. Our review of LG’s flagship shows that this new aspect ratio is much more comfortable than the traditional 16:9. The Galaxy S7 and the iPhone 7 are quite similar aesthetically, and I suppose that this will also be the case for the S8 and the iPhone 8. Between the iPhone 7 and the Galaxy S8, we see a clear generation gap. Apple has been able to keep the same design and repeatedly make it attractive for the past three years, especially the black version. The S8 introduces some massive changes into the design of the Galaxy S line. Without a doubt, the most noticeable change is the elimination of the traditional home button. At first, it was rumored that the S8 would be capable of recognizing fingerprints directly on the bottom part of the screen, but it looks like that technology hasn’t quite reached the necessary level to put it on Samsung’s flagship. Without a home button or this new technology, ultimately, Samsung has opted for a fingerprint sensor on the rear by the camera. Personally, I like the sensor on the back, but on the S8 you have to put your finger across the camera to reach the sensor, which makes me prefer the traditional solution of the iPhone 7 for this feature. Another huge difference is the drastic reduction of the bezel on the S8 compared to the rest of its competition, not just against the iPhone 7. This means that there is much less of a frame around the screen, allowing for a bigger display without making the phone too bulky. Apple devices are famous for leaving a large bezel above and below the screen. In this regard, I prefer without a doubt the screen size of the S8. Both Samsung and Apple put high-quality screens on their devices, although they focus on different aspects. iPhones have always had good brightness, which has proved to be useful on those sunny California days. It has also always used IPS LCD technology, just like the Galaxy S has always used a Super AMOLED panel. In my opinion, trying to choose between these two technologies boils down to a matter of taste. Personally, I lean toward AMOLED technology. The biggest difference between the displays is the aspect ratio and the definition. The resolution on the iPhone 7 is 750 x 1334 pixels with a size of 4.7 inches and a ratio of 16:9. That gives us a point density of 326 ppi. This resolution is more than that of traditional HD and is just enough to raise the pixel density such that they are invisible to the naked eye. The Galaxy S8 far exceeds these numbers: its resolution is much more elongated than normal with 1440 x 2960, giving it with an 18.5:9 aspect ratio, a diagonal distance of 5.8 inches and 568 ppi. It’s obviously a screen set for virtual reality. It’s elongated format, however, makes you lose a bit of the screen when playing anything in 16:9. The camera is always one of the strongest points for both of these smartphone series. The iPhone 7 has a 12 MP sensor, f/1.8 aperture, optical image stabilization (finally! ), auto-focus and a dual 4-LED flash. This camera produces crisp photos and generally does an excellent job. It more or less lives up to the good reputation that iPhone cameras are famous for. We haven’t been able to test out the camera on the Galaxy S8 yet, but we're expecting great things. The specs look to be very similar to the camera on the S7 with a dual-pixel 12 MP sensor, aperture of f/1.7, optical image stabilization and laser focus. It promises a lot, but its real rival here is the Google Pixel. Battery life is always a controversial topic. The S8 has the same 3,000 mAh battery as the S7 and, while awaiting our final review, I don’t think it will improve much on its predecessor. The iPhone 7 manufacturer doesn’t usually release specs about the battery, but it’s been calculated to be about 1,960 mAh. Given the enormous amount of energy demanded by the processors and the rest of the components, both devices could have more or less the same lifespan, which won’t last you a full workday. As we said above, we’ll have to wait for a final review of the S8 to get a better idea on this. The performance of the iPhone 7, with its custom processor and enviable RAM, was crowned the most powerful smartphone of 2016 by AnTuTu, right behind the iPhone 7 Plus. The European version of the S8 comes with an Exynos 8895 chip while the US version will have Snapdragon 835. It will also have a Mali G7 GPU, which tops performance numbers on the S7 and we suppose it’ll start gaining a bit of ground on the iPhone. In any case, both devices can boast the best fluidity that can be found on a smartphone today. Samsung Exynos 8895 Sorry, not yet available! 2.3 GHz Sorry, not yet available! The Galaxy S8 has just come out and it still has to prove itself in some regards, such as performance and autonomy. The screen and the design are eye-catching at first glance. They have a new and different feel that the iPhone 7 lost a while ago. 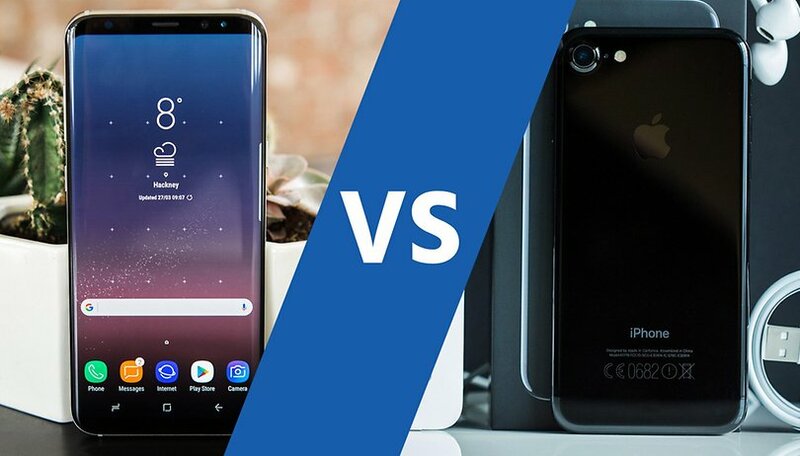 In practical terms, they’re both excellent devices and choosing between them will depend on whether you’re a fan of one of the brands or systems. Thinking out of the box to put my bias for Android phones aside, I don’t think the iPhone 7 can stand up to the Galaxy S8, but the real test will come when the iPhone 8 is released. Choose “Samsung Galaxy S8” or “iPhone 7”. Which one seems like a better option to you right now? Let us know your thoughts in the comments below! "It more or less lives up to the good reputation that iPhone cameras are famous for." Their cameras have never been famous or better then Android-based top performers. Currently I use SGS7 and my wife uses iP 7+ which was supposed to be equipped with oh-my-god camera. And last but not least - iP7+ camera lacks IQ big time - under the same conditions, SGS7 increased ISO to keep reasonable shutter time and stupid iP7+ kept ISO at 50 and shutter time 1/17s or something. So, all in all, as it has ever been, don't believe the (paid) hype - check it out yourself. I find neither of them compelling. I don't think it matters much what Samsung does. If it's trying to make ifanboys to buy Galaxy S8, it will not work. Ifanboys are particular type of people, who buy same thing year after year, same design, same grid of icons. I personally used iphone 6 and got annoyed with it's candy pop shape after couple of weeks (and bored to tears with same old grid of icons), but some people love it. Samsung had better focus on being more flexible with it's flagship range, instead of purely focusing nearly all glass body with near 100% glass to bezel ratio. Lot of people don't like such design and still like removable batteries too! Why can't Samsung produce range of flagships all with top specs, but offering different materials and options? I have galaxy S7, which is pretty, but I would never buy it with my own money considering how fragile this thing is. Instead, I would much prefer something like Note 4 with removable battery/back and upgraded specs. I agree I would love a Note 8 with a removable battery. I wish Samsung would do two models. Their edge models for those who care about look over function, and a flat screen model with removable battery for those of us that prefer functionality over looks. Until then I will be sticking to my Note 4. Talking about batteries - I might leave Samsung camp after so many years as I am fed up with the battery life. So in other words, removable battery is a great feature but good, long-lasting one is even greater.